The latest exhibition at the Palitz Gallery at the University’s Lubin House, “Quiet Intersections: The Graphic Work of Robert Kipniss,” examines over 40 years of the artist’s printmaking career. Thirty-five works from the Syracuse University Art Collection illustrate the artist’s graphic output, all from a gift by James F. White. The exhibition is open Monday to Friday, 10 a.m.-6 p.m., and will run through Nov. 12. It is free and open to the public. Contact 212-826-0320 or lubin@syr.edu for more information. 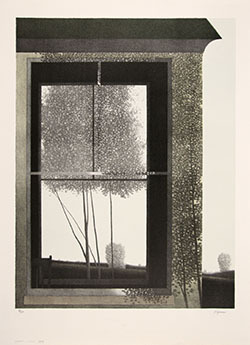 “Quiet Intersections: The Graphic Work of Robert Kipniss” is curated by SUArt Galleries Associate Director and Curator of Collections David Prince, who says Kipniss’ printmaking was initially spurred by commercial considerations, but over a relatively short time frame the artist developed an aesthetic interest and facility for the medium. “The prints in this exhibition examine subjects similar to his paintings, but offer different insights, often reflecting the print medium’s particular visual and technical characteristics of line and tone,” says Prince. Born in Brooklyn in 1931, Kipniss was the child of two commercial artists and had a passion for reading. After two years at a college in Ohio, Kipniss transferred to the University of Iowa, where he majored in literature, supplemented with elective painting courses. Kipniss remained at Iowa through graduate school, where he earned an M.F.A. in painting and art history in 1954. After serving two years in the army, Kipniss returned to New York City, where he held a series of jobs while he continued to hone his painting style. Slowly he found the most satisfaction painting representationally. Quiet landscapes, still lifes and interior scenes using a limited palette became signature images. A couple of days every week he visited galleries, usually unannounced, and showed his smaller canvases. Eventually, in 1959, he met Karl Lunde, the director of the Contemporaries gallery, who agreed to represent him. Kipniss later found representation with Ernest and Muriel Werner, who sold work privately and with Murray Roth at the FAR Gallery on Madison Avenue. These outlets helped Kipniss gain a toehold in the city’s cultural landscape.